This is my 10th installment of Babywearing Stories 365. Each installment features a babywearer in 1 photograph and their answers to 5 questions. My goal is to normalize, promote and celebrate daily Babywearing, moving beyond *what* we use to carry our babies and shifting focus back on *why* and *where* we carry. I hope to share the stories of moms, dads, and babywearing caregivers all over the world. Enjoy! I am an American software developer living in France with my French husband and 3 young girls. I didn’t wear my first child, but I discovered wrapping with my second and I’m wearing my third in this photo. I went on a ski vacation in the Alps (La Foux d’Allos), with my family not far from where we live. My older girls went to ski school while I dropped them off and picked them up wearing the baby. If the baby wasn’t too tired, we would sled next to the ski school. I’m wearing a Didymos Simon cotton stripes. I was enjoying walking on the slopes and being capable of dropping off and picking up my girls without being constrained by a stroller. This was in winter 2011, when my baby was 10 months old. We went back the following winter and I still wore her everywhere even though she could walk. It’s just very practical. 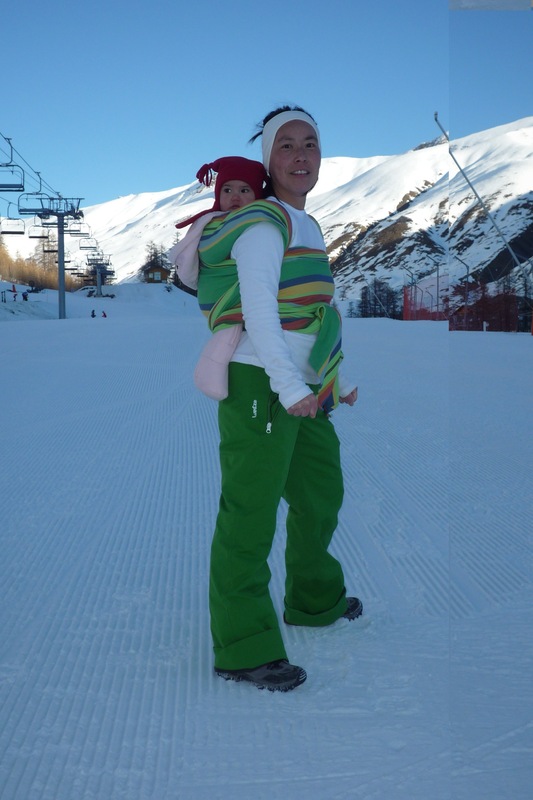 It really wouldn’t have been possible to walk anywhere in the ski village with a stroller. We would also take the shuttle from the slopes to the apartment, and babywearing was very practical in that case, especially when I had groceries and a sled to lug around. I started wearing my 2nd baby because I needed something that could make her stop crying. I had to do the same with my 3rd baby. But on top of it being a very effective solution for a crying baby, it is also very practical. In France, often elevators are too small for a stroller and a person to fit, and sometimes they stop in between floors. There are many, many cases where the only option is stairs, both in buildings and outside. And the aisles in stores here are extremely narrow, so often people leave strollers outside. So once I started babywearing, I never went back to strollers.